Roger Tellier of North Kingstown with a 26” cod fish he caught in the Seal Ledge area off Newport when tautog fishing Saturday. 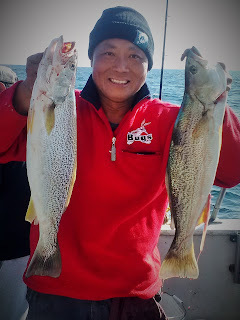 Squeteague (or weakfish) caught by Mike Kwok from Palisades Park, NY while fishing the Frances Fleet. Squeteague, once a popular fish in RI, is coming back with more and more caught in recent years. Climate change continues to warm local waters with mounting proof that it is changing our fishing environment. Fishing is changing so much that warm water fish are moving into the northeast and cold water fish are moving to deeper cooler water. If the environment is changing then our fishing laws, which all stem from the Magnuson-Stevens Act (MSA) need to be updated to reflect these changes too. Our fishing laws are based on historical fishing and survey data (what fish were caught where) and what was true in the past may not necessarily be true today or tomorrow. Climate change can have a positive, negative or neutral effect on species with different tolerances in any given geographic area. Over time we have seen in influx of warm water fish hear in our region, some of the changes have been good for fishing and some not so good. 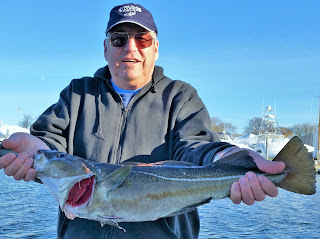 In Rhode Island, more cobia (an exotic warm water fish) have been caught than ever before, enhanced summer flounder and black sea bass have moved into southern New England but yet we have seen a decline in cold water fish like cod. Dr. Hare has shared a time lapse illustration that showed how yellow-tail flounder and summer flounder (fluke) are actually migrating north toward Rhode Island and other northern coastal states as the water warms. This time lapse illustration uses catch and effort data supplied to NOAA by commercial fishermen as a condition of their license. The data and time lapse illustration showed fish leaving waters to the south and moving northward. Dr. Hare’s work provides proof of warming water and species movement in and out of our region. Dr. Malin Pinsky of Rutgers University is a pioneer in using historical fishing trawl survey data collected by NOAA for years and looking at it differently. The data includes the fish caught in the trawl as well as latitudes, longitudes and the depths of each trawl. Once the historical fishing survey data base was built Dr. Pinsky and his team were able to pinpoint where fish populations were found—and if those locations changed over time. His work has been developed into an interactive application; it clearly shows movement of a variety of species in our region and can be found at http://oceanadapt.rutgers.edu/. How can fishing laws change to reflect climate change? We can do a lot to make sure our fishing laws and regulations reflect climate change. Our nation through NOAA is divided into seven regional fishery councils, in our area it is the New England Fishery Management Council. Ted Morton of PEW said, “Unfortunately, not all of the nation’s councils are having these important conversations (about climate change and fish movement) as they make decisions, because the law does not require them to practice this kind of modern management. “When Congress next changes the Magnuson-Stevens Fishery Conservation and Management Act, lawmakers should call for each council to create fishery ecosystem plans—road maps that can help managers understand the environmental factors that influence their fisheries so they can account for them and make more informed decisions.” said Morton. The Magnuson-Stevens Act is 40 years old and has been updated several times. It is now time for another update. Capt. John Sheriff of Captain Sheriff’s Fishing Charters, LLC will give a RI Saltwater Anglers Association presentation on tips and techniques for catching striped bass with a focus on Block Island on Monday, November 30, 7:00 p.m. at the West Valley Inn, West Warwick. Non-members welcome with a $10 donation to the RISAA Scholarship Fund, RISAA members attend free. Dinner offered by the West Valley Inn between 5:30 p.m. and 6:30 p.m. Visit www.risaa.org for information. Striped bass fishing has taken a back seat to tautog and cod fishing, however, anglers are catching migrating fish. “Schools of herring were off the southern coastal shore this week with garnets diving on them so I’m sure some are picking up bass feeding on the herring .” sad Matt Conti of Snug Harbor Marine. Monster tautog: Mike Kwok of Palisades Park, NJ with the 14.8 pound tautog he caught last week when fishing the Frances Fleet. How fish stock assessments and quotas are used to regulate recreational and commercial fishing is often mind boggling. The science and data that is used in assessments to determine desired stock biomass (the fish in the water) is complex, current and historical fishing activity is robust, and quotas that aim to achieve rebuilt and sustainable fish stocks are all taken into consideration to make regulations. Combine this with the variety of fishermen user groups vying for the same limited resource and you have a very complex equation. Recently two meetings occurred that can give us some insight into what commercial and recreational regulations might be for 2016. The first is the Atlantic States Marine Fisheries Commission’s (ASMFC) annual meeting held in early November. The ASMFC regulates migratory species along the east coast including many of the species targeted by recreational and commercial fishermen in Rhode Island. The second meeting was held Monday, November 16 at the URI Bay Campus. 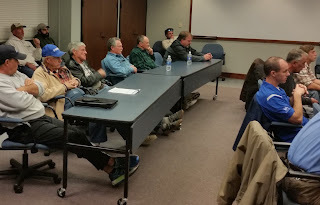 It was a Department of Environmental Management (DEM) Marine Fisheries Division’s workshop and public hearing on proposed regulation options for the commercial fishing of summer flounder (fluke), bluefish, scup and black sea bass. Similar meetings will be held to gather input from recreational fishermen in a couple of months. Here are meeting highlights and what impact they could have on 2016 fishing. A recent tautog assessment has shown that we may be overfishing the species; however, the assessment will not be reviewed until the August 2016 ASMFC tautog board meeting so more conservative regulations will not be put in place by the ASMFC for 2016. The tautog board tasked its Plan Development Team with the development of a draft Amendment focusing on two regional management options along with a status quo option that would treat Virginia to Massachusetts as one coastal coast wide region. The other two options being considered group Massachusetts and Rhode Island together. A black sea bass stock assessment is underway; however it will not be completed until the end of 2016 for potential use in 2017 the earliest. However, in 2015 the Mid-Atlantic Fishery Management Council’s Scientific and Statistical Committee developed a way to set quota for data poor stocks, our quota for 2016 has increased slightly. The 2016 commercial quotas were increased by 20% (by 59,317 pounds). This is good news as the commercial fishery experienced multiple closures in 2015. DEM proposed a status quo option based on a daily possession limit and a second weekly aggregate model with a variety of sub-periods. A third option proposed by Town Dock of Narragansett aimed to avoid season closures by putting a 25 pound/vessel/day limit into play, and if closure had to occur the fishery would close just one day a week, Friday, so that fish could be caught Saturday and be available on Sunday the busiest market day. The Recreational Harvest Limit (RHL) has been set at 2.88 million pounds for 2016 in RI. This is good news for recreational fisherman as this year the RHL was set at 2.33 million pounds so we should see some liberalization of BSB regulations. A scup benchmark study was done in 2015. The scup stock is not overfished and overfishing in not occurring relative to biological reference points. However, a 4% reduction in commercial quota is recommended. The Marine Fisheries Division recommends a status quota regulation for commercial fishing in 2016 with three sub-periods and a 9” commercial minimum size just as we had last year. No new proposals were brought fourth at the workshop. Recreational fishing regulations for scup will likely be status quo or a bit more conservation as well. A bluefish stock estimate was done in 2015. Bluefish are not overfished and overfishing is not occurring relative to the biological reference points, however, the estimated biomass is below the biomass target. A 10% reduction in commercial quota has been established for 2016 which is a decrease of 35,682 pounds. Commercial recommendations made at DEM’s meeting include a status quo option which features two sub-periods splitting the year in half with 50% allocated in each six month period as well as a second option with an aggregate possession limit of 3,500 pounds/vessel/week. A third option was presented at the public workshop and hearing that included an 18” minimum size and split the year into three periods with 500 pounds/vessel/week in the shoulder periods, 1/1 to 4/30 and 11/16 to 12/31, and a 4,000 pounds/vessel/week primary season running from 5/1 to 11/15. Summer flounder (fluke) is not overfished, however, overfishing is occurring. No 2015 commercial fishery closures. The commercial quota for 2015 was 1,719,629 and in 2016 it is 1,274,091 a decrease of 445,538 pounds which is a 30% decrease. At the meeting a new option was proposed by Town Dock of Narragansett which aims to leave the season open (like the black sea bass recommendation). Other options included a status quo option and one that reduced season starting possession limits to meet the 30% decrease. More conservative regulations are likely for recreational fishermen, as in the past reduced bag limits, shorter seasons and perhaps a higher minimum size will be explored. Regulation options with public input are also vetted by the Rhode Island Marine Fisheries Council (RIMFC) that makes fishing regulation recommendations to DEM director Janet Coit. The director then makes final regulation decisions. Stock status, meeting presentations, options proposed and full annotated regulations on above commercial regulations can be found at www.dem.ri.gov; the public comment period on the above commercial options is open and will end at 4:00 p.m. on Thursday, November 26. Striped bass. “Customers fishing from shore at Fire District Beach have caught fish to 37” mixed in with school bass” said Mike Wade of Watch Hill Outfitters. 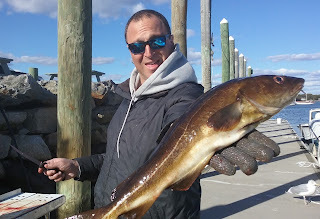 “Squid fishing is still very good off Newport and off Jamestown with Ft. Wetherill experience a particularly good bite.” said Dave Henault of Ocean State Tackle, Providence. 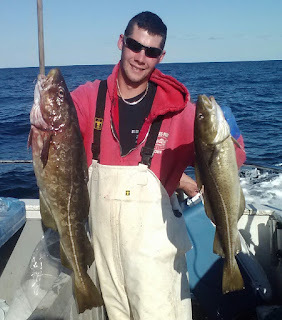 Eric Appolonia, North Kingstown, with a 24” tautog caught off Newport southeast of Seal Ledge. Angler Greg Vespe of Tiverton landed three squid at once. Greg reports an outstanding squid run. 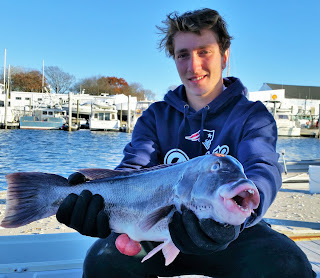 Alex Appolonia of North Kingstown (a senior at Bishop Hendricken High School) with tautog caught while fishing with his father Eric on No Fluke Charters off Newport. Giant bluefish (14.17 pounds and 33”) caught by Gil Bell of Charlestown, RI at a Washington County Beach last week. Tautog fishing this past week was hot. Arguably the best it has been in years. And so was fresh Rhode Island seafood on plates in Newport and around the state. This week, Newport Restaurant Week partnered with Rhode Island Seafood, a collaborative formed by the RI Department of Environmental Management (DEM) to support local fishermen. The aim of the collaborative is to increase awareness and consumption of locally fished species. The RI Seafood seal, which is appearing on Newport Restaurant Week participant’s menus, guarantees that a menu item’s seafood was landed right here in Rhode Island waters. The RI Seafood Seal Initiative is actually a state- wide effort available on fish throughout the state as long as the processor landing the fish has applied to participate in the program and has been approved to use the seal because they guarantee that the fish has been landed in Rhode Island. Once approved, customers of processors landing the fish all along the supply change can use the RI Seafood seal such as distributers, fish markets, supermarkets and restaurants. Recreational fishermen who eat their catch, know that locally caught seafood is fresher, in that the time from ocean to dinner plate is less. Of course, locally caught seafood doesn’t guarantee freshness. We still have to be advocates at the market and in restaurants and ask if the seafood was landed in RI, does it have the RI Seafood Seal and how old is the fish. And remember, in a fish market it is OK to ask to smell the fish. Fish the smells fishy won’t necessary harm you, however, it does mean that bacteria has set in and implies that the fish is older. The RI Seafood Seal is a good step to help insure consumers that the seafood they buy and eat is landed here in Rhode Island and supports local fishermen. The Rhody Fly Rodders will feature their charity of choice ‘Reel Recovery’ at their annual fly tying for charity meeting Tuesday, November 17th, 6:30 p.m. at the Riverside Sportsmen Association, East Providence, RI. ‘Reel Recovery’, the beneficiary of this year’s annual fly tying event is a national organization that offers a retreat for men recovering from cancer. Experienced tyers will take the lead and instruct meeting participants on how to tie their favorite patterns. The flies will be collected and then sold at fishing shows and meetings, with all proceeds donated to ‘Reel Recovery’. For information contact Peter Nilsen, president, Rhody Fly Rodders at pdfish@fullchannel.net or 401.633.5329. “Simply put, my book ‘Tag is in the Fish’ is about both traditional and electronic fish tagging along with some information about my personal tagging of both bluefin and stripers.” said Capt. Al Anderson about his new book now at the publishers. Capt. Anderson who had been a charter captain out of Pt. Judith operated the charter fishing vessel the Prowler for many years. Capt. Rene Letourneau of On The Rocks Charters with a West Bay tautog he caught Tuesday while fishing with Dave Henault of Ocean State Tackle. Capt. Joe Pagano, taxidermist and charter captain from Stuff-It Charters, with a 60 pound striped bass mount. 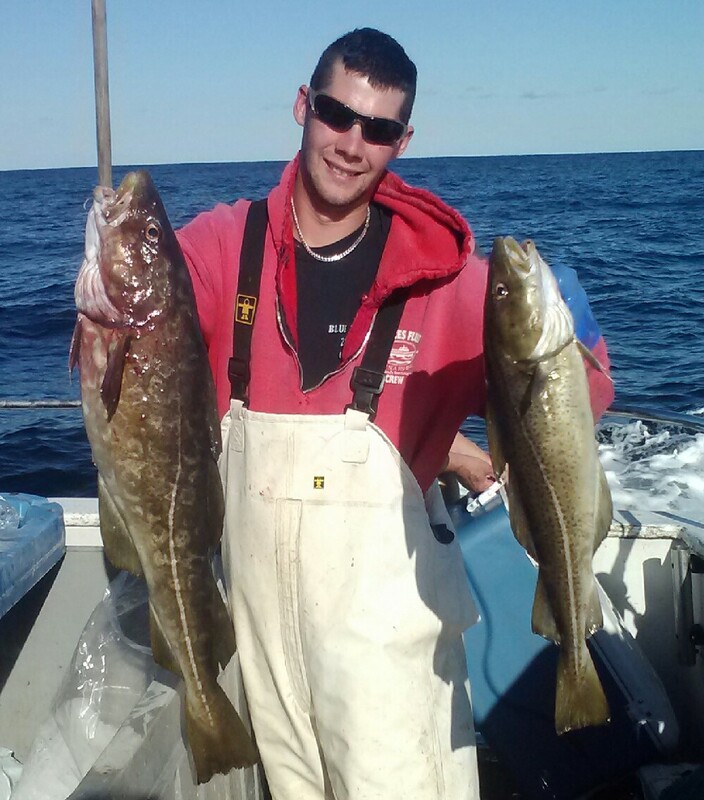 Chris Konkol from North Kingstown RI with the brace of nice cod to ten pounds he caught last on the Gail Frances party boat. In a recent angler survey by Southwick Associates of Fernandina Beach, when anglers were asked to note the reasons they like to fish, 88 percent of survey respondents cited "I like to spend time outdoors." It was the most selected response. The desire to be outdoors was followed by "I like to spend time on or near the water." which was noted by 84 percent. The challenge experienced when fishing, selected by 80 percent of respondents even paled to simple "fun," which was selected by 83 percent. As I mentioned last week in this fishing column, my personal feelings about fishing were reflected by most other anglers. Fishing is seen as a social activity with 71% citing spending time with friends and family as a key motivator. Only 50% cited eating their catch as a primary reason to fish. 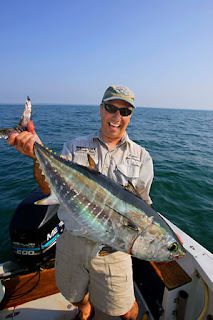 "Many people love to spend their free time on the water with friends and family," says Rob Southwick, president of Southwick Associates, which designs and conducts the angler survey (as well as hunting and shooting surveys). "Fishing offers a lot of recreational benefits, but one of the biggest is the chance to simply get outside and enjoy nature. Angling is the preferred way to achieve the overall outdoor experience." Visit www.anglersurvey.com for survey details. Capt. Joe Pagano’s website at www.stuffitcharters.com . 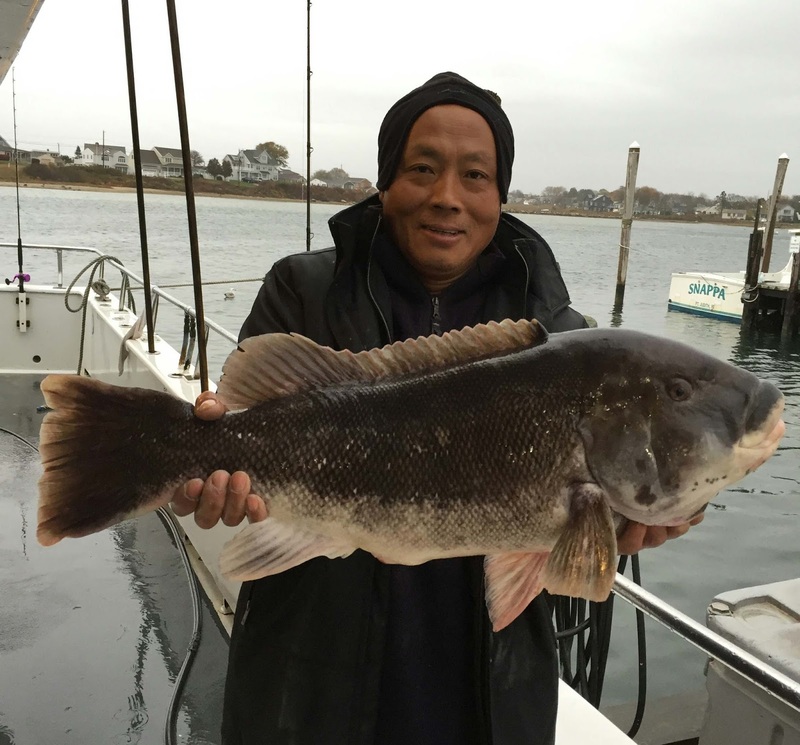 Tautog fishing continues to improve with fish being taken in Narragansett Bay and along the coastal shore. 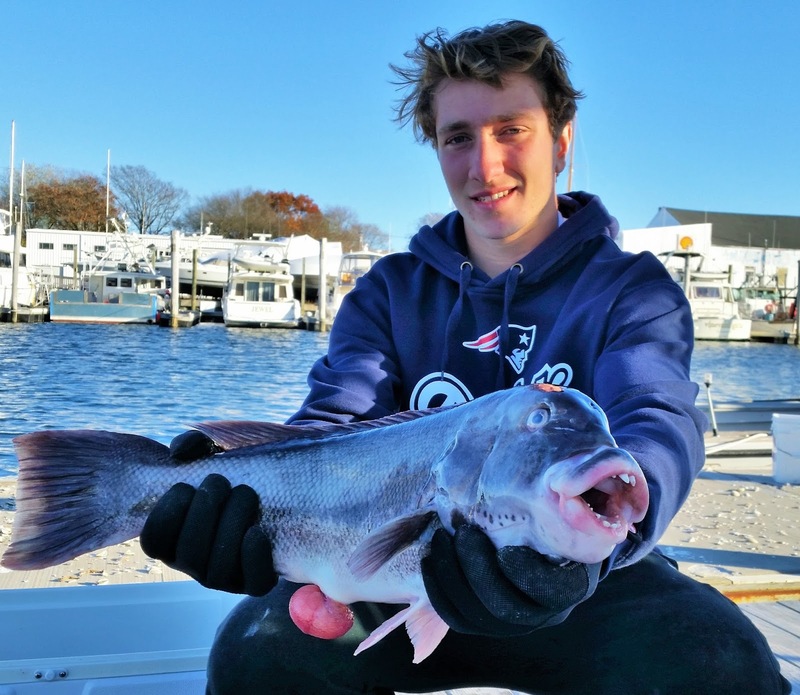 Neil Hayes of Quaker Lane Outfitters, North Kingstown said, “Customers are catching tautog at just about any rock pile. And at places such as Whale Rock, Pt. Judith Light and Plum Point Lighthouse they are catching fish.” I fished the Newport area about ½ mile southeast of the Seal Ledge can Sunday for an hour after returning from Block Island with no luck. However, customers fishing closer to shore seem to have better luck producing fish. “Dirty water this weekend made tautog fishing challenging but customers still caught fish so this is a very good sign” said Matt Conti of Snug Harbor Marina, South Kingstown. John Littlefield of Archie's Bait & Tackle, Riverside, said, “Customers fishing the Providence River at the Heart Club just north of the Hurricane Barrier said they caught many short fish there but the Wharf Tavern in Warren produced two keepers for them. Others are reporting a good tautog bite in the Jamestown Bridge area.” Capt. 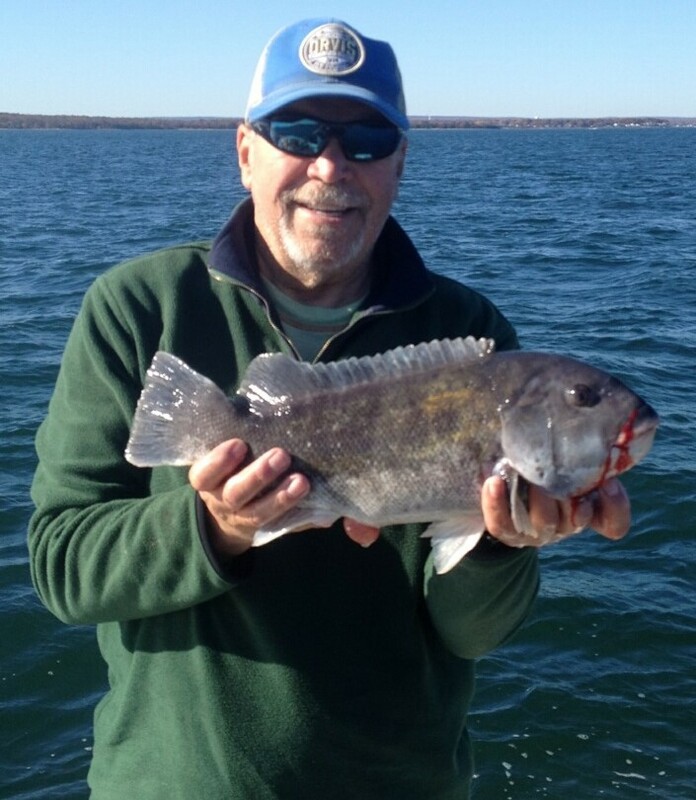 Frank Blount of the Frances Fleet, said, “Tautog fishing continues to be very strong. Fishing was outstanding last week with limits common place. We broke the ten pound barrier with a fine tog of nearly 11 pounds and had two other fish in the 10 pound range. Varying numbers of sea bass mixed in but a few trips early in the week saw some fishers have a limit of those to go along with their tog and a few keeper cod.” “Tautog are still in low water as the temperature in the Westerly area is still in the 60’s. Once the water cools the fish will be moving to deeper water. We weighed in a couple of eight and nine pound fish caught inside of Fishers Island that were in fairly low water. 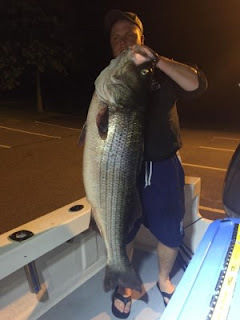 The tautog bite is going to do nothing but improve so I am looking forward to fishing.” This Tuesday Dave Henault of Ocean State Tackle called me from the water when fishing with Capt. Rene Letourneau of On the Rocks Charters. 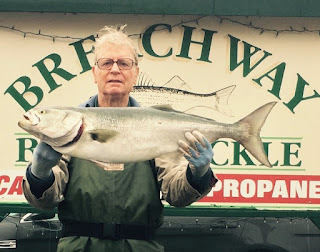 Dave said, “We have caught about forty fish and four keepers, the bite is very, very soft and subtle.” They were fishing in 40 feet of water on a rock pile off Jamestown. 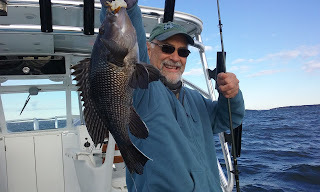 Black sea bass, cod and scup bite is still strong. “Anglers are catching their black sea bass limit in waters along the southern coastal shore where they normally catch summer flounder. However, they have moved to deeper water” said Mike Wade of Watch Hill Outfitters. I fished with angler Steve Brustein Sunday and we had little trouble catching our limit at the southwest ledge on Block Island with scup in the 15” range. Four party boats from New York where fishing the southwest ledge hard for black sea bass and scup. 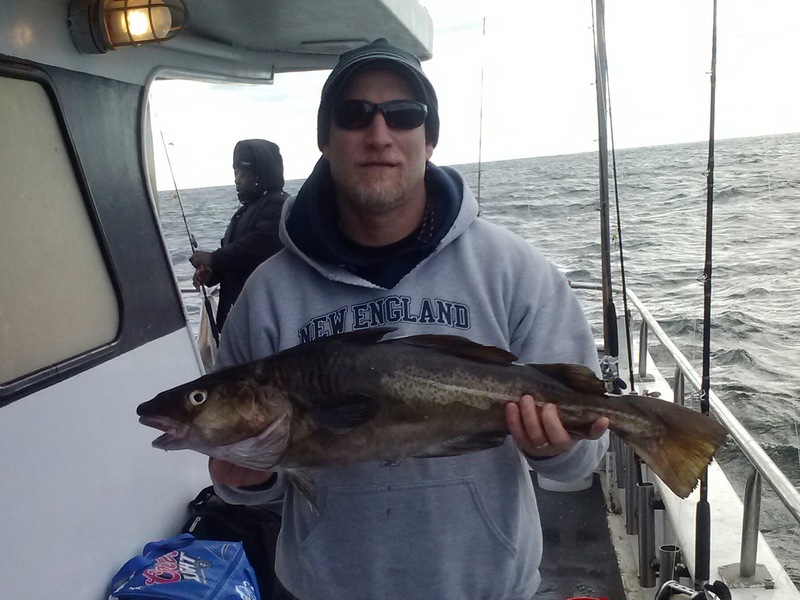 Neil Hayes of Quaker Lane said “The black sea bass and scup bite is good but it is starting to slow.” “Cod fishing was good this week both on the southeast and southwest corner of Cox’s Ledge. The good news is that anglers can keep sea bass they catch in Federal waters so it makes traveling that distance worthwhile.” said Matt Conti of Sung Harbor Marina. “This weekend customers fished the Newport area for seabass and all three limited out with 28 fish to four pounds.” said John Littlefield of Riverside. Freshwater fishing remains very strong. “I had a customer that caught a great variety of fish at Echo Pond, Barrington including largemouth bass, trout and pickerel so fishing is pretty good. I am still selling quite a few shiners.” said Littlefield of Archie’s Bait. “Trout fishing at the lakes, ponds and rivers that were stocked by DEM has been very good.” said Neil Hayes of Quaker Lane. Visit www.dem.ri.gov for a listing of stocked pounds. 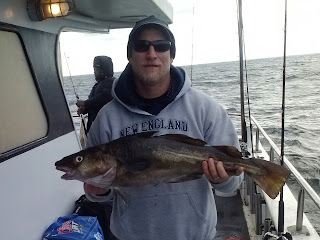 Tim Stanhope of Bellingham, MA with a ten pound pool winning cod caught on the Frances Fleet. I fished with family and friends this past week. And I have to tell you it was great. It reminded me of what I have always known, but often forget. Sometimes I get caught up in the frenzy to catch fish when taking people fishing for hire as a charter captain. And somethings, I loose perspective and think it is all about the fish. What fishing with my son Geoff, and friends Chuck, Kevin, Steve, Jim and Rick reminded me of this past week is that sometimes it is not all about the fish. But rather it is about the bond that is developed and enhanced between mothers, fathers, sons and daughters, sisters and brothers, father-in-laws, old and new friends. Fishing affords you the time to get to know someone. You talk about challengers and dreams, and sometimes just have plan old fun. Thank you Geoff and friends for helping me keep a proper perspective about fishing. A new approach by U.S. Geological Survey scientists to modeling water temperatures resulted in more realistic predictions of how climate change will affect fish habitat by taking into account effects of cold groundwater sources. The study, recently published in the journal Ecological Applications, showed that groundwater is highly influential but also highly variable among streams and will lead to a patchy distribution of suitable fish habitat under climate change. This new modeling approach used brook trout, but can be applied to other species that require cold water streams for survival. "One thing that has been missing from other models is the recognition that groundwater moderates the temperature of headwater streams," said Nathaniel Hitt, a fish biologist and study coauthor. "Our paper helps to bring the effects of groundwater into climate change forecasts for fish habitat." Climate change models predict that summer air temperatures will increase between 2.7 and 9 degrees Fahrenheit in the eastern United States over the next 50 to 100 years. Such increases in air temperatures will increase water temperatures of streams and rivers and pose a significant threat to fish like brook trout that have low resistance to warming water temperatures. Brook trout are an important cultural and recreational species with specific restoration outcomes identified in the new Chesapeake Bay Agreement. "Our models help improve the spatial resolution of climate change forecasts in headwater streams," said Craig Snyder, a USGS research ecologist and lead author of the study. "This work will assist conservation and restoration efforts by connecting climate change models to places that matter for stream fishes." The study is available on the ESA website at http://www.esajournals.org/doi/10.1890/14-1354.1. A workshop on proposed commercial fishing regulations for Rhode Island will be held November 16, 4:30 p.m., followed by a public hearing at 6:00 p.m. at the URI Graduate School of Oceanography, Coastal Institute Building, Hazard Room. Public comment will be solicited on amendments to "RIMFR - Finfish" including commercial management for summer flounder, bluefish, scup and black sea bass as well as editing changes and proposed amendments to the RIMER- Legislative findings. Small businesses which are either currently licensed, or in the future may seek a license to harvest, buy, sell, or produce seafood products, as well as the small businesses that provide services related to those engaged in such industries, are requested to comment on the proposed regulations. Comments should focus on how proposed regulations can be changed to minimize the impact on businesses affected. A copy of the proposed regulations is available for review through November 16, 2015 at the Marine Fisheries offices, or by mail. A copy of the proposed regulation(s) has been filed with the Office of the Secretary of State’s website at http://sos.ri.gov/ProposedRules/. Proposed regulations are also available on DEM’s Website. Written comments concerning the proposed regulations may be submitted to Peter Duhamel, Division of Fish and Wildlife Marine Fisheries office, 3 Fort Wetherill Road, Jamestown, RI 02835 no later than 12:00 Noon on November 16, 2015. The Atlantic States Marine Fisheries Commission’s (ASMFC) will hold their 74th Annual Meeting November 2‐5, 2015 at the World Golf Village Renaissance Resort in St. Augustine, FL. Many key issues that will impact recreational anglers in Rhode Island will be discussed and/or determined. Stock assessments, reports and fishery management plan recommendations on species such as tautog, scup, black sea bass and summer flounder are expected. Some species, such as summer flounder and tautog, may have more conservative regulations due to overfishing and/or recent stock assessments. For agenda and meeting materials, visit http://www.asmfc.org/home/2015‐Annual‐Meeting. You can also attend meeting sessions via a go to webinar or listen in via conference call. Striped bass fishing is good along the coastal shore but many anglers are focusing on other species. “This week we had a school of bass in the 20 pound range come through the south shore in the Green Hill area and anglers did well. But it is hit or miss this time of year as the fish are moving, migrating south. There one day and not the next. The North Rip has been good too. Anglers are using diamond jigs with success and eels at night or early morning as the bluefish are killing the eels during the day.” said Matt Conti of Snug Harbor Marina, South Kingstown. 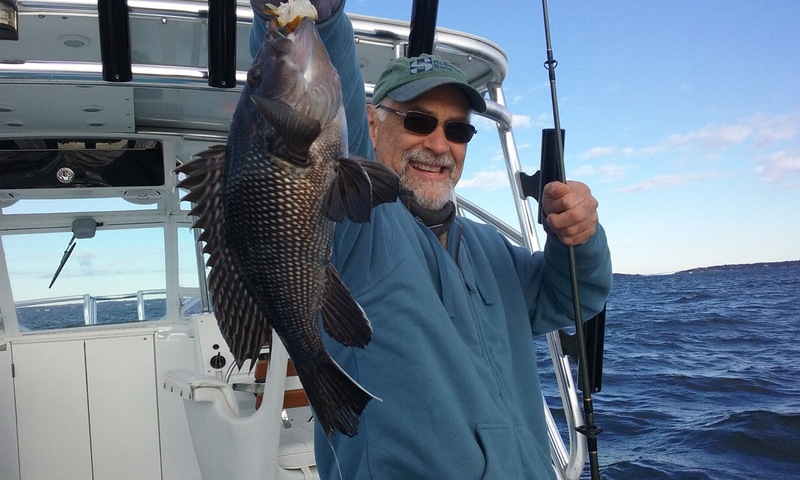 “Black sea bass opened up again in Federal waters (October 22) so anglers can keep their Rhode Island limit of seven fish.” said Matt Conti of Snug Harbor Marina. “Black sea bass being open in Federal waters is big, now anglers targeting cod fish in places like the East Fishing Grounds can keep some of the sea bass they have been catching when targeting cod.” “Guys are still targeting black sea bass and are doing good.” said Manny Macedo of Lucky Bait & Tackle, Warren. 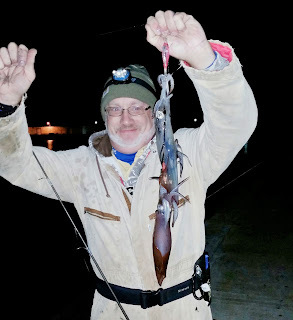 “Squid fishing is good in the Jamestown and Newport areas. Anglers are catching squid at Ft. Wetherill, Ft. Adams and on the Goat Island causeway.” said Dave Henault of Ocean State Tackle. “Squid fishing is great. Some customers are walking out of here with $50 to $100 of squid jigs. They are catching them in Newport on the Causeway and Jamestown at the usual places.” said Manny Macedo of Lucky Bait. Freshwater fishing for trout is good, particularly at ponds stocked by DEM in the past two weeks. Visit www.dem.ri.gov for a list of ponds. “Trout at Carbuncle Pond and at Lincoln Woods are taking PowerBait worms as well as small and medium shiners.” said Dave Henault of Ocean State Tackle. Catch and release… and then mount your fish? Steve Brustein caught this cod (about to be filleted) while tautog fishing off Newport. 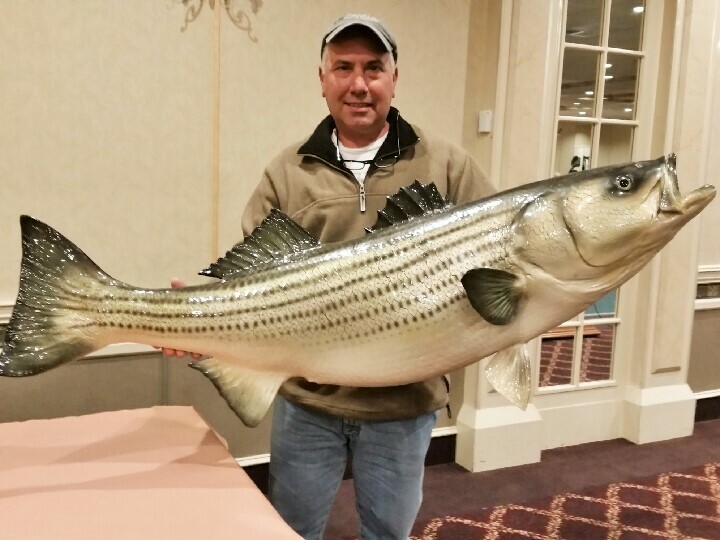 Mike Radziszewski’s 57 pound, eight ounce striped bass that took first place in the Pabst Blue Ribbon Fishing Tournament. Capt. Joe Pagano of Stuff-It Charters will speak about taxidermy at a RISAA meeting Monday, October 26 at the West Valley Inn, West Warwick, RI. How would you like to stuff a 10’ 2” Alaskan Kodiak brown bear, a full size lion attacking a zebra, or better still recondition a polar bear originally prepared in the 1800’s and build an iceberg for it to stand on alongside another bear at the Roger Williams Park Zoo? This is what Captain Joe Pagano of Stuff-It Charters has done since high school as a taxidermist along with preparing a full range of fish mounts… shark, bluefin tuna, striped bass, cat fish, largemouth bass and much, much more. Next week Capt. Pagano will be guest speaker at a Rhode Island Saltwater Anglers Association Monday, October 26, 7:00 p.m. meeting at the West Valley Inn, West Warwick, RI. And of course, the topic will be taxidermy. Many of the animals like the panda bear he stuffed came from a zoo where the animal had passed away and now was being preserved for exhibition. “Taxidermy in the winter and taking people fishing in the summer is all I have ever done.” Pagano is a noted local charter captain who fishing in the surf near shore for striped bass with his boat often fishing at night. He practices catch, tag and release with many of his customers. And, in 1991, Captain Pagano caught the second largest fish in the world ever landed by rod and reel. It was a 2,909 pound, 15 1/2-foot long Great White Shark. The evening starts with an optional West Valley Inn Dinner from 5:30 p.m. to 6:30 p.m. Non-members are welcome and are asked to make a $10 contribution to the RISAA Scholarship fund, no charge for RISAA members. Visit www.risaa.org (calendar) for details. The final winners of the Pabst Blue Ribbon Fishing Tournament received their awards Saturday at a special ceremony held at the Ocean Mist Restaurant, South Kingstown, RI. This is the tournament’s fourth year with an expanded time frame and weekly, monthly and overall tournament prizes for striped bass, bluefish and summer flounder (fluke). Visit www.pbrfishing.com for details on tournament winners. Tautog fishing was outstanding this week. Both shore and boat anglers have been limiting out. And this weekend (October 18) the limit increased to six fish/angler/day. However the ten fish boat limit is still in place (does not apply to charter or party boats). Again this week I fished off Newport with great results. 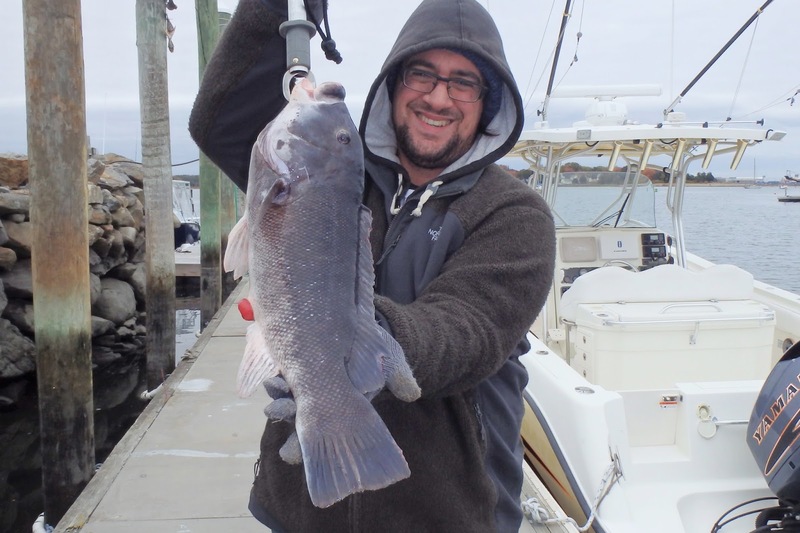 In addition to tautog, the two anglers on board Kevin Fetzer of East Greenwich and Steve Brustein of West Warwick caught five black sea bass, scup and a cod. Yes, a cod fish while fishing with green crabs for tautog. In fact a number of cod fish were caught in shore this week. Nelson Valles of Maridee Bait & Canvas, Narragansett said, “A few customers caught cod in shore this weekend, two anglers were fishing Black Point for tautog and caught cod fish.” Valles said, “Tautog is being landed off the rocks from shore all along the Avenues.” “Commercial tautog fishermen are having no trouble catching their ten fish limit. Tautog fishing is very, very good right now. Recreational fishermen are doing very well too.” said Tom at Snug Harbor Marina in South Kingstown. “A customer fishing Coddington Cove Saturday with two friends caught thirty shorts and nine keepers. And those who fished Conimicut Light would go through a half gallon of crabs to catch three keepers. However the bite from shore at the Wharf Tavern and at the bridges in Warren and Barrington is good. 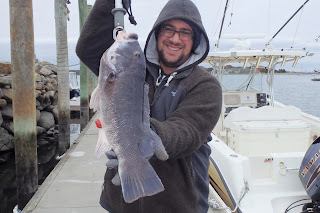 Anglers are catching keepers, a much improved tautog bite from last week were most were catching shorts.” said John Littlefield of Archie’s Bait & Tackle, Riverside. Black sea bass are still plentiful. 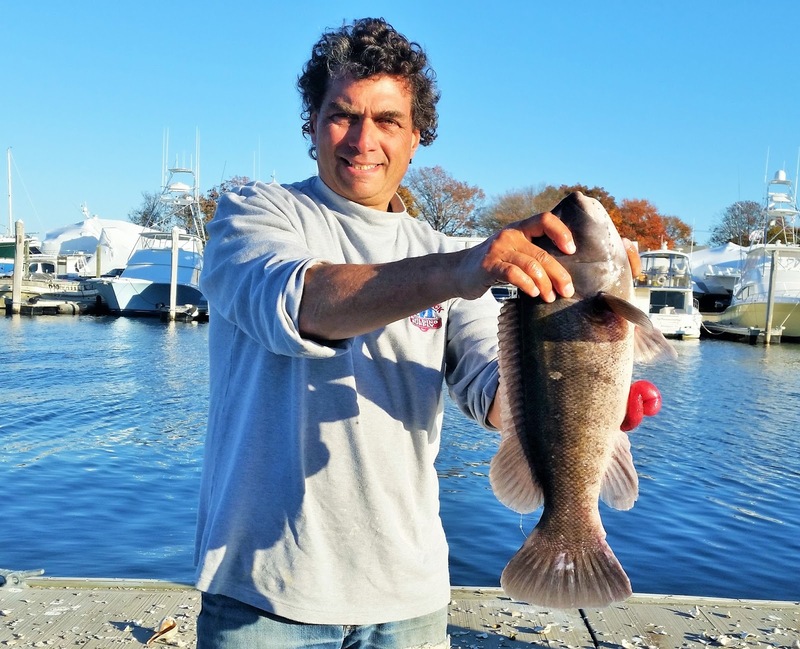 Few anglers are targeting, but rather they are catching them while tautog fishing. Anglers are still catching sea bass at Colt State park when tautog fishing said John Littlefield of Archie’s Bait & Tackle. Striped bass fishing has slowed. Nelson Valles of Maridee Bait & Canvas said, “It's hit of miss with striped bass. If you are fishing from shore you may as well stay put and wait for a school of bait to come close to shore.” Fall striped bass are generally migrating and are on the move. “Many school size bass are in Salt Pond and anglers are catching them often.” said Tom of Snug Harbor Marina. 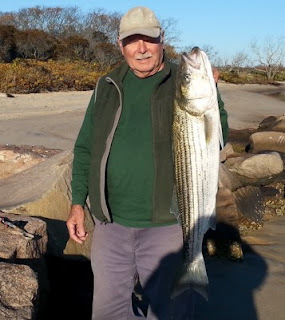 Striped bass fishing in the upper Bay has slowed with some fish being caught in the Mr. Hope area.” said John Littlefield of Archie’s Bait & Tackle.